Gunasiri Hotel | No. 90, St. Michael’s Road Colombo 3A Vittanachchi has sat behind the counter at the Gunasiri Hotel for over 30 years, Pradeep Vittanachchi tells me. Tucked into the corner, just past St. Michael’s Church, the ‘Gal palliya’ kade is a favourite with locals. Since his father Premadasa passed away, Pradeep runs the small establishment with his mother, Gunawathi. Depending on seasonal availability, the kade offers 15 possible accompaniments to your buth packet – 3 types of egg, 6 types of seafood, 4 types of chicken, and mutton. A kottu station outside will serve up a few other unusual combinations – you can have yours with cuttlefish or sprats. (At Rs. 260, the most expensive dish on the menu is the mixed kottu.) The kade is open by 6:30 a.m and aside from the standard breakfast dishes, they serve a kurakkan roti which is best eaten with katta sambol, says Pradeep. If you’re planning on dropping by for dinner, they’re open till 10 p.m but get there earlier or you might find their signature mutton soup sold out. Just next door is another reason to visit Gunasiri. The Natural Fresh Fruit Juice stall that Nimal Adikaari and his family run is heaped with baskets of fruit. Most juices – avocado, papaya, passion fruit, orange, mango and woodapple – are a very affordable Rs. 50, while some like lime and narang are Rs.40. You can buy a 1.5 litre take away bottle of fresh juice for just Rs. 200. They’re open on most days till 6 p.m and on Saturdays till 3 p.m and on Sundays till noon. Priding themselves on their ‘fast, clean, tasty, pure vegetarian foods’ Sarawathie is one of the old guard. They’ve been around since 1942 says Mr. Alaganathan who has worked there for 30 of those years. Open from 6:30 a.m to 10:30 p.m, the restaurant sells a mouth watering variety of South Indian foods. Their crisp masala dosais (Rs. 130) are popular, as are their iddli (Rs.40), bondas (Rs.40) and uttapam (Rs. 140). The special this week is a masala dosai roasted in ghee – it is 20 rupees more than the kind cooked in boring vegetable oil. While Mr. Alaganathan hails from Kandy, his team of chefs comprises both locals and Indians imported for the job. Aside from their standard menu, they also sell a range of Indian sweets and savouries – crisp, curling murukkus and sweet, sticky deep orange jalebis make their display cases inviting. Not to be mistaken with the new Yaal Hotel, the older Yarl Hotel is one of the few kades in the city to specialise in Jaffna cuisine. It’s a little hole in the wall down Station Road in Wellawatte – on your right if the sea is at your back – and has a rather unprepossessing appearance. For the discerning gourmand, all that is made somewhat inconsequential by a piquant, flavourful crab curry. If you trust Rick Stein, it’s the best crab he’s eaten (a claim made on his BBC Far Eastern Odyssey series). The day we’re there we’re sold two lovely specimens for the price of one – manager Bala Suresh thinks they’re rather small. He should know, he’s been selling crab for nearly seven years at Yarl. The hotel itself is 37 years old and belongs to a Mr. Nanda Kumar, Bala tells us, revealing that Yarl used to be a ‘saiver’ or vegetarian kade. That’s hard to imagine today, with the display case packed with several – mostly seafood – curries in flaming shades of red. Three vegetables, a dhal, and coarse red kekulu rice are heaped onto neat squares of kehel kole or banana leaf for which you’re charged a fair Rs. 100. Everything else is extra. A portion of crab, for instance, is Rs.260. The kade also serves favourites like pittu and string hoppers for dinner. They’re open seven days a week from 11:30 a.m to 3:30 p.m for lunch and from 6 p.m to 10:30 p.m for dinner. If there were a king of kades, Upawansa would probably be it. Their two storey establishment on a busy main road can seat over a 100 people (some of the others would be hard pressed to seat 25) and they even have their own goldfish tank. The kade is best known for their soups – vegetable, beef, fish, egg, chicken and mutton soups can each be had for Rs.170 or less. They serve a ‘half’ rice and curry for just Rs.115. Samantha Prasanna inherited the business from his grandfather, and today he is to be found at the back of their adjoining grocery store. He shares his air-conditioned cubicle with his five- year-old son, Dilan, who is just back from school. He tells me his 40- year- old business is still demanding – he has it open by 5 a.m. everyday and he keeps it so till 11 p.m. Breakfast is all the local staples – from lentils like mung atta and kadala to the creamy chunks of milk rice or kiribath. Lunch is a selection of Sri Lankan-Chinese dishes, traditional rice and curry and some clearly inauthentic but nevertheless much sought after lamprais. In the evening you can pick from a selection of ‘rottis’, kottu, string hoppers and pittu among several other dishes. The store has its own bakery that serves short eats and bakes roast paan. If you’ve been tempted by the isso vadai at Galle Face but been put off for reasons of hygiene, you could try the ones at Upawansa. Fat and succulent, they’re Rs. 35 a pop. (Also available: ulundu and dhal vadai.) The hotel’s cleanliness comes with a guarantee from the Colombo Food Authority – Samantha has a certificate hung in a place of pride behind one of the cashiers. President Rajapaksa himself is said to stop for rotis on his way home. Raheema’s has been in the business since 1947, says Mr. Hussein, explaining that a roti could be had for as little as 10 cents back then. 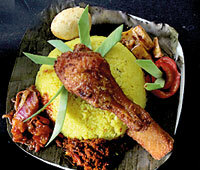 Their buriyani, oily and spicy, is still famous and can be had with mutton (Rs.330), chicken (Rs.290) or beef (Rs.330). Other signature dishes include the chicken palandi (a subtle curd based curry light on the chilli, according to Mr. Hussein) and the beef steak, which are meant to be eaten with the hotel’s thick rotis. Arguably though, the pinnacle of the hotel’s achievement is its chicken kottu (Rs. 300). On the sweeter side, they are known for their muscat which comes in a rainbow of electrifying colours (Rs. 400 a kilo) and for their sweet wattalapam (Rs. 70 a serving). Like another famous Colombo institution, Pilawoos, Raheema’s too serves iced Milo (Rs. 70.) However, it is nostalgia that outsells all these. Grateful old students love to come to Raheema’s, says Mr. Hussein, pointing out that many still ask for their favourite ‘No. 1 waiter’, old Mr. Sanoon, who has been serving here for 45 years. Tags: Colombo, Galle Face Green, Rick Stein, Sri Lanka. Bookmark the permalink.